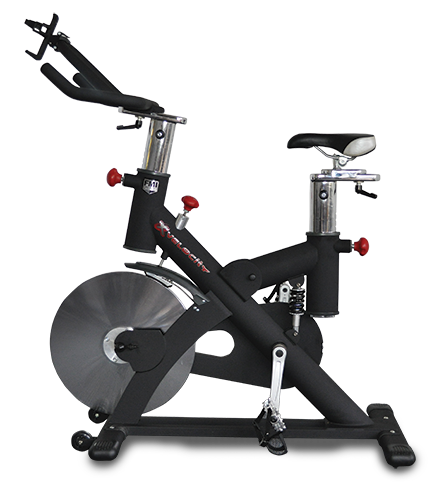 The Fitnex X Series Velocity Indoor Cycling Spin Bike is Finex’s flagship spin bike. It is built to impress. Great bike if you like spinning for exercise, if you are training for a century or preparing for a triathlon. You cannot go wrong with this trainer. Feature highlights include a precision machined, 47 lbs flywheel with a belt driven system. Spring shock suspension mounted to a durable frame. High performance indoor cycling pedals. SKU: FMI-Velocity Categories: Exercise Bikes, Fitness and Exercise Equipment Tags: exercise bike, fitnex, indoor bike, spin bike, trainer, trainer bike Brands: Fitnex. The Fitnex X Series Velocity Indoor Cycling Spin Bike is the ultimate in spin bikes. Perfect for getting exercise by spinning at home or if you need a trainer for a long distance race or triathlon. This bike will give you a consistent and satisfying workout time and time again. Five-year frame warranty, one-year warranty on pillow block bearings, tension knob assembly, bracket bearings, and drive belt, two year warranty on cranks, bracket spindle, flywheel, handlebar, seat post, handlebar post, a 90 day warranty on wear items such as foam grips, quick-release handles, seat, pedals and toe straps and brake pad. Labor warranty of 90 days from date of purchase. Be the first to review “Fitnex X Series Velocity Indoor Cycling Spin Bike” Click here to cancel reply.